People nowadays have become more conscious with their weight and what they eat, thus various diet plans emerged. Among the most successful diet programs is Medifast. With a number of famous personalities and celebrities sharing their testimonials about Medifast, the program became the next talk of the town. Later on everyone who has seen this on the television and on the internet got inspired with the weight loss stories that are actually motivating. The success and effectiveness of Medifast diet program may be due to its flexibility. Medifast clients enjoy the benefit of online consultations and choosing healthy and mouthwatering pre-packed meals. All these and many more made Medifast the talk of the town. Looking closely at this program, we can see pros and cons of it which are relative to the needs and lifestyle of the client. Medifast, a medically supervised diet plan, introduces the basic 5 and 1 Plan where clients are given 5 pre-packed meals to consume and can prepare one “lean and green” meal on their own. People with different demands and lifestyle can choose from the four different support system provided by Medifast: Contact Center for online support; Take Shape for Life for those who want a Health Coach; personalized counseling for clients who visit a Medifast Weight Control Center; and your own physician. Pre-packed meals are made available as soon as you have chosen your support system. Medifast Promo Codes are also offered from time to time. This allows Medifast clients to save over $100 in every order of Medifast meals. Various Medifast coupons for 2014 have already been offered, providing their clients big discounts, free shipping of orders and a lot more. Because of this, losing weight has become more affordable. A Medifast promo code such as Save $67 on $250 Purchase and 56 Free Meals plus Free Shipping are just among the reasons why more and more people join Medifast and stick to their diet program. One catch, however, is that clients are given limited choices of pre-packed food, with barely 70 varieties to choose from. Clients may feel the need to look for a new palette to fill their stomachs with. The great thing is that there are Medifast prepackaged goods that can be prepared into various meals. This is good news for people who want to experiment in cooking but still want to watch what they eat. Most clients do not actually find the mixing and jumbling of Medifast meals to get a variety of servings. Besides, you get to eat brownies and chocolate chip soft bake which often restricted from other diet programs. Other treats for Medifast clients include Dutch Chocolate Shake, French Vanilla Shake, Cinnamon Roll Crunch Bar, Fruit and Nut Crunch Bar, Mixed Berry Cereal Crunch and the list goes on. Medifast clients can also order flavor infusers in a variety of flavor which are good antioxidants and can help burn more calories. Five to six meals are consumed by Medifast clients, once every two to three hours. This allows your body to undergo a mild fat-burning state, ensuring safe weight loss without taking any weight loss drugs. After you achieve the weight that you want, Medifast will still help you with the Medifast Maintenance Plan. Through this, you can avoid gaining additional pounds. This is possible through the principles used by the Maintenance Plan, including portion control and proper nutrition. You can still use any of the Medifast Coupons 2019 for your maintenance meal orders. Up to 2 to 5 lbs. per week can be lost if you stick with your diet plan with Medifast. And because Medifast was developed by a physician, you lose weight without losing the essential nutrients. This is because every Medifast meal is packed with vitamins and nutrients, keeping your body healthy while shredding off excess weight. Medifast is ideal for men and women who want to lose weight safely. People with diabetes can also undergo the weight loss program, thanks to Medifast for Diabetes. Clients are given low-glycemic index foods and other alternative meals that have different amount of calories and carbohydrates to support their special weight loss program. Since 1980, this diet program has been praised by medical practitioners. Over 20,000 physicians have positively endorsed Medifast to their clients. And because a physician developed it based on clinically proven approach, Medifast clients can be assured that they lose weight without risking their lives. 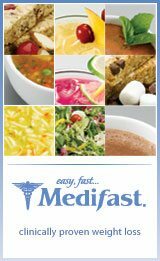 Medifast is just one of the many diet plans out there. As days pass by, seemingly more and more competitors arise, all promising prospective clients to lose weight in no time. In the end, choosing which the better diet plan is will boil down to the lifestyle of the person who wants to lose weight. Very busy people can choose Medifast for the pre-packed meals, while those who want more freedom in their food choice may try to consider other options. Whatever program you wish to try, it is still best to consult it with your physician. Keep in mind that a program that worked for a celebrity may not be the best option for you. And if you do not give your full dedication to your chosen diet program, every effort will just be wasted. Now if you are ready to lose some weight, be very much prepared for a lifelong commitment.